What is a Hosted Email Filter? A hosted email filter is a Software-as-a-Service (SaaS) filtering service hosted on a remote server – usually in the cloud. It has it benefits over on-premises email filters inasmuch as a hosted email filter has fewer (if any) maintenance overheads, can easily be scaled up or down depending on the changing environment of your business, and is generally cheaper than an on-premises solution. Most service providers host their email filtering services in high security data centers, have SLAs in place for when outages occur, and provide expert support and monitoring 24/7. For many SMBs, a hosted email filter is the ideal spam filtering solution, as it leverages cloud-based services to provide an enterprise-class solution for businesses on a tighter budget. Does a Hosted Email Filtering Service Filter Emails Any Better? That depends on the email filtering service you choose. Not all hosted email filtering services are the same, and some lack key mechanisms that (in our opinion) sacrifice online security for performance. Naturally, the filtering settings applied by a system administrator will also influence how effective a hosted email filter is at protecting a business from email-borne threats as well. For this reason, the best hosted email filtering services are those which are easy to use. A hosted email filter can have all the “granularity” in the world to apply different settings to different users depending on their roles; but if it is too complicated to apply different settings to different users – and gaps in the filtering parameters allow spam emails to enter the business – the high level of granularity is worthless. When you use a cloud-based email filtering service, the filtering process is conducted in the cloud – eliminating any strain on the business´s CPU or mail server. Therefore, it is difficult to comprehend why some service providers omit to include resource-intensive features such as greylisting and outbound filtering in their services – unless it is to save resources at their end. Greylisting in particular is a very important online security mechanism. Most email filtering services use SURBL filters to block the delivery of emails from IP addresses from which spam email is known to have originated. What greylisting does is return every email and request it is sent again. Spammers´ servers are usually too busy to respond to the request, so the email never gets resent. In this way, a hosted email filter with greylisting prevents the delivery of spam emails from not-yet-known sources of spam – giving businesses a higher level of protection against email-borne threats such as phishing, malware and ransomware without any loss of network performance. The greylisting process can create short delays in email receipt, which is why we also include a whitelisting feature in our hosted email filter in order to allow emails from trusted senders to bypass the greylisting security mechanism. Our hosted email filter is SpamTitan Cloud – a full-service email security solution that protects your business, your email users and your contacts. Being a cloud-based email filtering service, SpamTitan Cloud is easy to set up, requires no software installations, and is managed via a web-based portal with an intuitive user interface for the simple application of user policies and parameter settings. SpamTitan Cloud has a verifiable spam detection rate of 99.97% due to its multi-layered online security mechanisms (which include SURBL filtering and greylisting). 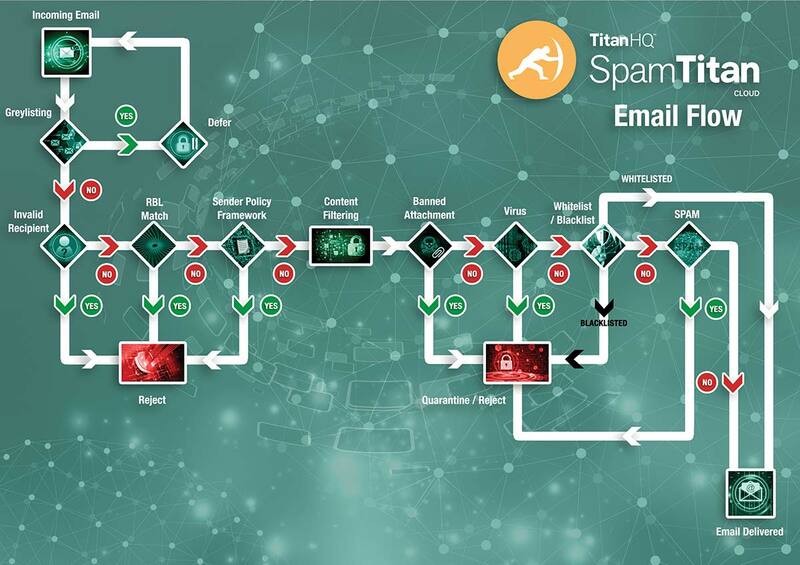 SpamTitan Cloud also uses Real Time Blacklists (RBLs), sender policy frameworks, recipient verification and Bayesian analysis to offer the best level of protection against spam email and the potential threats it contains. As the filtering service user, you decide on what spam thresholds are acceptable to you and how you want spam email treated (deleted, quarantined, etc.). Reports can be scheduled daily to advise you of deleted and quarantined emails so you cam amend the thresholds as necessary. Finally, all inbound and outbound mail is scanned by dual anti-virus engines to ensure not only your network is protected from email-borne malware, but the networks of your clients and business contacts as well. If you are concerned about the volume of spam email evading detection in your business, you are invited to try SpamTitan Cloud free for thirty days. Our free trial gives you the opportunity to experience the power of SpamTitan Cloud in your own environment (or our anti spam software based gateway solution), witness how easy it is to use, and monitor its effectiveness at preventing spam email entering your network. In order to take advantage of this opportunity, either click the “Start Free Trial” button at the top of the page, or speak with our team of Sales Technicians. Our team will be happy to answer any questions you have about our hosted email filter and guide your through the registration process to start your free trial of SpamTitan Cloud. The process only takes minutes to complete, so contact us today to find out more.